Sparkle Paper Towels Modern White are 2-ply paper towels with Thirst Pockets – specifically-designed to be strong and absorbent. Sparkle Paper Towels Modern White have Pick-A-Size paper towel sheets to clean any mess big or small. 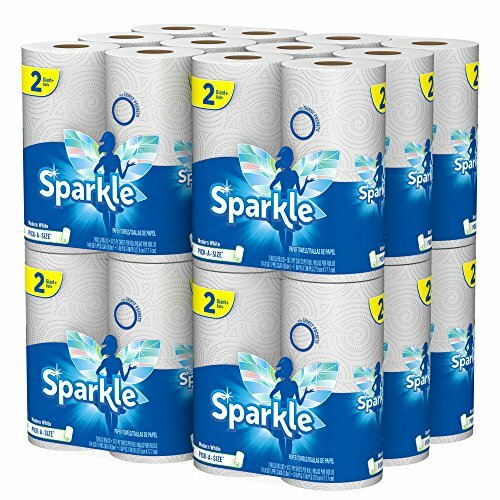 This pack of Sparkle Paper Towels Modern White includes 24 rolls of 2-ply Modern White paper towels that are equivalent to 46 regular rolls. They work perfectly to clean everyday messes and brighten up your home whether in the kitchen, garage, or bathroom. Sparkle Paper Towels Modern White offer all you need to shine at an affordable price and are the perfect towels for clean up all over the house. From the kitchen to the bathroom, on a paper towel holder, or on the countertop, you’ll absorb moisture and leave counters and mirrors streak free—for a house that shines every time! On top of all of that, Sparkle Paper Towels Modern White are a giant help for food preparation and cooking, to clean glass, kitchen counters, bathroom vanities, appliances, make-up brushes, or keep in your car for any on-the-go emergency occasion. And so, we ask: Why pay more for everyday little messes? If you have any questions about this product by Sparkle, contact us by completing and submitting the form below. If you are looking for a specif part number, please include it with your message.